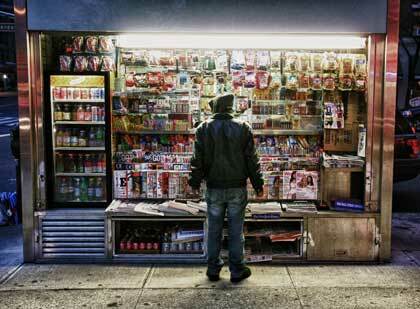 Vividly colored photographs of shop windows around the world. With cities, it is as with dreams: everything imaginable can be dreamed, but even the most unexpected dream is a rebus that conceals a desire, or its reverse, a fear…. Bullock’s striking photographs, based on the theme of shop windows he has encountered in his travels around the world, exhibit different aspects of this observation by Calvino. Though the contents of the photographs are about the face of commercialism, the form of each evokes perceptual dimensions that frame them psychologically and emotionally. In many ways they are brash, but also vivid, imposing but also reflective. On exploration, the image of Jackie Onassis shows interesting subtleties. Reflected buildings, from various angles, stand behind the models, who look out both from them and presumably at them, and at us. Meanwhile, Jackie, like a beacon, radiates a kind of superconscious attentiveness; on close inspection, the reflections of bare tree branches emerge from her hairdo like neuronal pathways reaching into abstract space. As the artist noted in private conversation, this work operates on a variety of semiological levels. 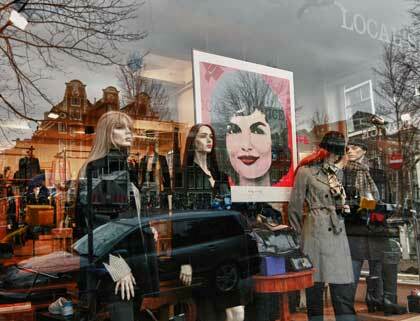 Not only is the array of displayed mannequins expressive of high style, but Jackie herself is an icon of that world, an emblem of style both in dress and disposition. As she stares knowingly through the window into the space of the street, she calls our attention to what Calvino calls the dreams of desire that the scene captures, vivid and colorful, yet evanescent, like the reflection of building, tree and street. 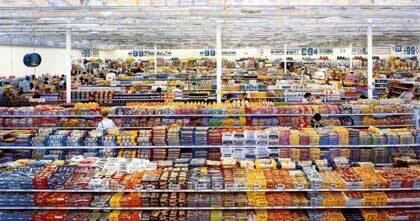 The picture of the guy standing before a food shop store front calls to mind some of the work of contemporary German photographer Andreas Gursky, who frequently takes the repetitive emblems of modern commercial culture as a starting point for imagistic condensation. Here, as we stand back from the array of displayed foods, we watch the broad display from the distance as we see, as well, the consumer up close, becoming in some sense a part of the scheme. The array is garish but beautiful, and the simply clothed observer lights up our attention much as the bright supervening fluorescent illumines the display. As we pause before these pictures of windows, we do, as Calvino observes, take them into ourselves, assimilating what seem like the most commercially mundane elements of a cityscape into the realm of dream, thought, image, and into their emotional analogues, desire and fear. With his eye for vivid image and his sensitivity to dream and desire, Bullock effectively invites us into both dimensions.